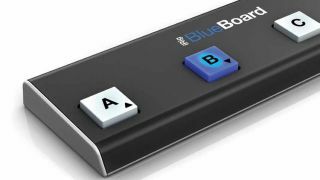 It's a Bluetooth pedalboard... so it's called the BlueBoard. IK Multimedia is certainly going for it at this year's CES, announcing a whole range of mobile music making products. One of the most intriguing of these is the iRig BlueBoard, an iOS Bluetooth MIDI pedalboard that features four backlit programmable rubber pad switches. Two inputs for additional expression pedals/switches are included too, and the device is compatible with not just IK's apps, but other CoreMIDI compatible ones too. It runs on three batteries and, because it's Bluetooth, doesn't require the use of your dock connector. The most obvious users of the BlueBoard are guitarists, but other iOS musicians who perform on stage may also fancy it. Expect to see it later in 2013.